Most of those involved in agriculture understand that farming can be a volatile business, with wide swings in profitability and earnings. But just how wide are those swings and on average what should one expect in terms of a return for their investment in agricultural assets? This week we take a look at the historical experience of the rate of return on assets in agriculture. The rate of return on assets, or ROA, is a very useful measure of profitability. ROA is calculated adding net farm income plus interest expense minus any unpaid labor or management and dividing that total by the average assets of the farm sector. The basic interpretation of ROA is that it tells us the return generated for each dollar of assets invested in the sector. For example, if ROA is 4% each dollar of assets generates about $0.04 of return. 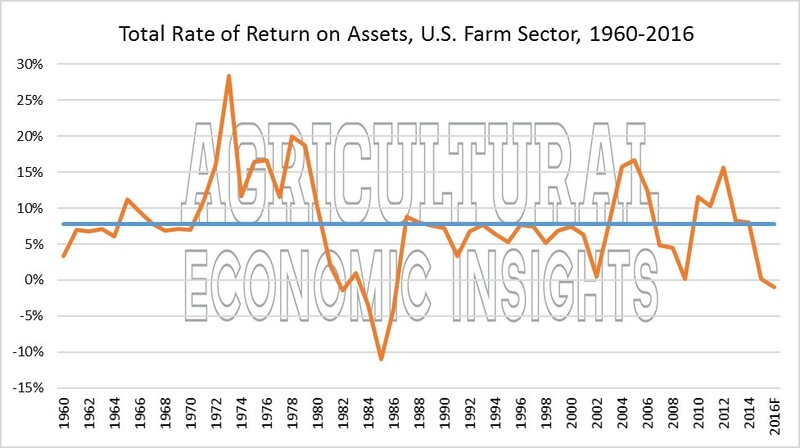 Figure 1 shows the rate of return on assets for the U.S. farm sector from 1960-2016. As you can see, this graph shows that rates of return are quite volatile, ranging from a high of 28% in 1973 to a low of -11% in 1985. The average total rate of return on assets over this period was 7.7% and is shown in blue. This is a relatively high return when one considers that it is for the entire for the entire sector. However, the standard deviation is also quite large, coming in at 6.4%. This means that returns are regularly higher and lower than average by a meaningful amount. Figure 1. Total Rate of Return on Assets, U.S. Farm Sector, 1960-2016. The ROA shown in figure 1 is the total rate of return for the sector and includes both returns from operating farms and those from changes in the value of farm assets, which the USDA Economic Research Service calls real capital gains. The ERS breaks these two sources of return into what they call the rate of return on assets from income and the rate of return on assets from capital gains. It is important to realize that the real capital gains/losses are changes in the ERS estimates of real asset values in the sector and not capital gains realized by selling farm assets. In other words, most of these items are economic gains but are not realized income. Particularly in the short-run it is important to focus on the rate of return from income as that source of return is much more readily realized by farmers. Figures 2 shows the estimates of the rate of return on assets from current income (orange) and the rate of return on assets from real capital gains (blue). For the time being, I have displayed both returns on the same graph. Of these two series it is clear that the returns from capital gains are much, much more volatile. While the capital gain series has swung from over 20% to – 15%, the rate of return from current income has ranged from a high of 7.7% (1973) to a low of 0.9% (2002). In fact, the scale of the graph necessary to contain the capital gains series makes the current income series look relatively stable. Figure 2. Rate of Return on Assets from Capital Gains and Current Income, U.S. Farm Sector, 1960-2016. Just to illustrate the scaling effect, take a look at the rate of return from current income graphed on a different scale (figure 3). The picture looks quite different, but the data are the same as shown before (figure 2). The average rate of return from current income is 2.8% with a standard deviation of 1.1%. The 2016 USDA forecast for the rate of return from current income is 1.25%, well below the long-run average. Figure 3. 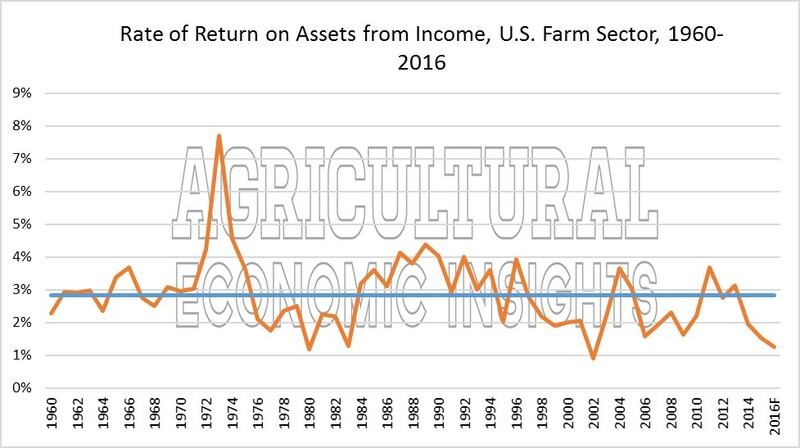 Rate of Return on Assets from Current Income, U.S. Farm Sector, 1960-2016. The current rate of return from income in the farm sector is 3rd lowest of the 57 years shown in this graph. Only 1980 and 2002 are lower. We often talk about the tremendous incomes of the recent period, but when you examine the rate of return on assets from current income, the recent boom period is not readily observed (take a look at figure 3 again). Certainly farm income increased rapidly in that period, but asset values also increased very rapidly. In other words, a significant amount of the increased rate of return during the boom came from increases in farm real estate values. And yes, the absolute value of net income in the sector increased rapidly in the boom, but incomes did not grow meaningfully faster than asset values. The rate of return from income is typically quite low in agriculture. Simply put, the current earnings only provide a small amount of the total return in the sector. For example, recall that the average ROA for the sector was nearly 8%, but the rate average rate of return from income is just under 3%. So on average, the rate of return from real capital gains has been about 1.75 times the rate of return from current income. In other words, the cash returns are generally much smaller than the returns from changes in farm asset values. This is not entirely surprising given the large long-term asset base of the sector (80+% of the assets are real estate and buildings). The reality is that the capital gains from the sector (those that make the returns appear high on average) are not harvested very frequently, and sometimes they are only harvested as a last resort to satisfy cash flow needs. Further, changes in income influence changes in asset values. As incomes fall, asset values tend to decline, making capital gains turn negative. So what does all this mean? First, when looking at the rate of return on farm assets it is clear that there is a considerable amount of volatility in the farm sector. This has significant implications for how farms are managed. In particular, it suggests that under most circumstances debt levels should be managed very carefully. Second, the biggest driver of the volatility in the total ROA is often changes in asset values. At this point the returns from current income in the farm sector are among the lower recorded in the last 50 years. One might infer that unless incomes start to improve, asset values will continue to decline. Photo Source: Flickr/United Soybean Board. Soybean Harvest.